Hearing My Heart: Towards Tallinn - Part 1 - Where is Tallinn? 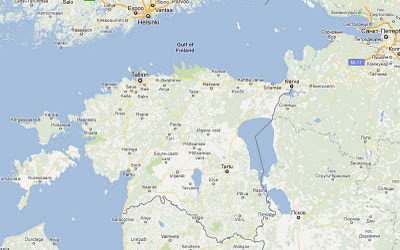 Towards Tallinn - Part 1 - Where is Tallinn? It's been 10 months now since God first impressed upon me His desire for my family to move to Tallinn next summer. And during these months, the phrase 'Towards Tallinn' has come through, almost as a prophetic banner. Because in the here and now, we have 'great works' to do in St Petersburg, with our wonderful friends in Hope Church where we have been living and serving for these last three years, and where we have many more months of doing just that. But there is also this thread running through what we are doing, at every level, that is also preparing for us, usually in very small ways, for our move to Tallinn - what we are doing now, is very much getting us 'Towards Tallinn". So that is the direction we are facing - and it will be God who ultimately gets us there. As we've started to talk about Tallinn, we've had many people who have asked us where it is. Maybe thinking it another part of Russia, or in the St Petersburg region somehow. It does seem that Estonia is a little outside the usual geography of most, and understandably so. Maybe had it not been for the vision here to plant into Tallinn, which we've had with us these last three years as a church, we too may not have been so aware. So let me give you the basics, and we'll see where this leads. of the EU (useful for us as British citizens, thereby we can live there without a visa). Estonia is also now in the Euro Zone, having switched completely to the Euro as it's sole currency on the 1st of January this year. Tallinn is the 2011 joint European Capital of Culture. Estonia has a total population of about 1,400,000, with Tallinn taking around 400,000 of that total. So it's a lot smaller than the 5-6,000,000 people that live in and around St Petersburg. In fact, you could take the whole of Estonia, Latvia and Lithuania (three former Soviet States) and still not have the population of St Petersburg! Therefore the city of Tallinn is a lot easier to get around - the pace of life seems much better too! Tallinn is on the northern coast of Estonia, directly south of Helsinki, the capital of Finland and north of Riga, the Latvian capital. The fastest ferry you can get across the Gulf of Finland would have you in Helsinki from Tallinn in just 1 hour, 15 minutes. Stockholm, the capital of Sweden, lies due west of Tallinn and is about a one hour flight. And St Petersburg is of course east of Tallinn, making it a very well located city for these other 4 cities. Getting around Tallinn is very easy. You can easily walk around the city on foot, getting from one side to the other in something like 30 minutes. The bus network is also good, though it seems most buses just take you into the centre. From there you need to get another bus out if you happen to be crossing the city. But the best way to get around is by bike. Tallinn (and I think Estonia in general) has a great (really great!) network of dedicated cycle paths, that are safe and free of cars. There are a number of cheap airlines that fly into and out of Tallinn. Ryan Air for example will soon be flying to Manchester, Luton, Gatwick, Liverpool and Edinburgh in the UK - as well as other direct flights to Dublin, Barcelona and many more. The official language of Estonia is Estonian - though many, especially in Tallinn, also/only speak Russian because up until 1994 (when Estonia regained it's independence), Estonia was a part of the Soviet Union. What the church will look like in the years to come - we can only dream and imagine. 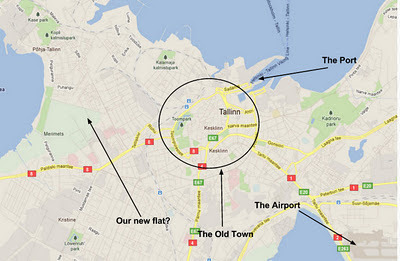 But I hope this helps you understand where Tallinn is a little and helps direct your prayers! One final thing - for Europeans travelling there, you do not need a visa, nor do American's (there may well be others as well) - just an encouragement if you feel God leading you to be a part of the future church plant that is Tallinn.